Offering you a complete choice of products which include bipap machine. We supplier a wide range of BIPAP machine which is ideal for the treatment of tubercular and non-tubercular lung diseases. 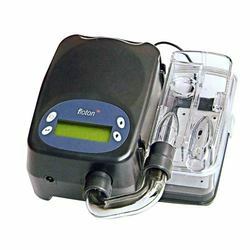 This BIPAP machine offers efficient bi-level positive airway pressure treatment for a variety of respiratory conditions including Obstructive Sleep Apnea (OSA). As there are significant numbers of Chronic Obstructive Pulmonary Disease (COPD) cases that require ventilator support. In such cases, non-invasive ventilator support without the complications of invasive ventilation proves to be very effective. Unique in its ability to set reverse ratio in ST and T ventilation up to 4:1. Looking for BIPAP Machines ?